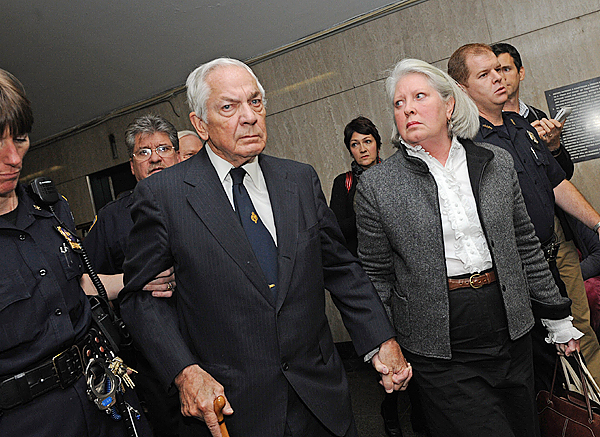 NEW YORK — Brooke Astor’s 85-year-old son was convicted Thursday of exploiting his philanthropist mother’s failing mind and helping himself to her nearly $200 million fortune. Anthony Marshall now faces a mandatory jail sentence of at least one year — and perhaps as many as 25 years. Jurors delivered their verdict on the 11th full day of deliberations, ending a five-month trial that revealed the New York society doyenne’s sad decline. She was 105 and had Alzheimer’s disease when she died in 2007. Marshall, wearing a dark suit, looked at the jurors as they were polled. Morrissey, 66, looked down but didn’t betray any emotion. They will remain free on bail until their Dec. 8 sentencing. Morrissey faces up to seven years in prison. After the jury left the courtroom, Marshall’s wife, Charlene, stood at the rail with her hand on Marshall’s shoulder, her eyes glistening. When reporters asked her for a response, she said only, “I love my husband,” and gave him a brief hug. The couple walked out of the courthouse, hand in hand, to a waiting limousine. The case put Astor’s famous friends, including Barbara Walters and Henry Kissinger, on the witness stand and her dark final years on display. Jurors heard how a beau monde benefactor renowned for her elegance and wit became a disoriented invalid fearful of her own shadow. Marshall “stole from his mother while she suffered from Alzheimer’s disease, making her life worse while enriching his own,” prosecutor Elizabeth Loewy said after the verdict. Marshall was accused of a range of tactics — from scheming to inherit millions of dollars to simply stealing artwork off her walls. Morrissey was accused of helping manipulate a confused Astor into changing her will to leave Marshall millions of dollars that had been destined for charity. 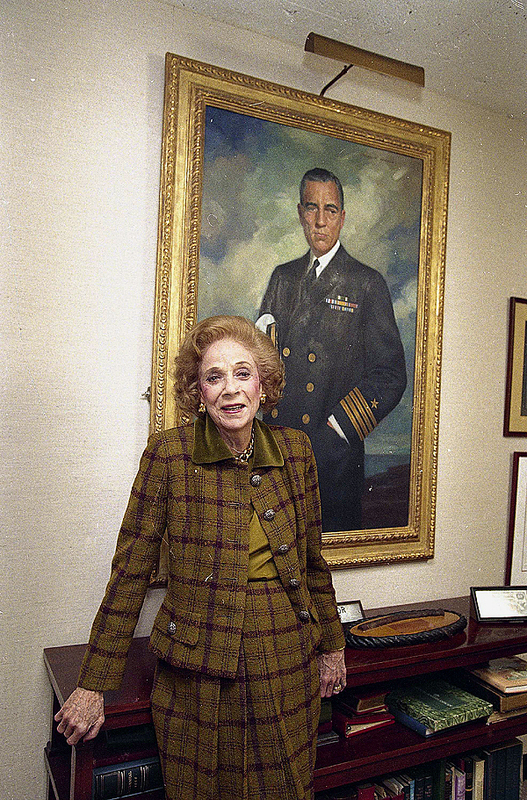 Astor’s last will, created Jan. 30, 2002, left millions of dollars to her favorite charities. Amendments in 2003 and 2004 gave Marshall most of her estate. Prosecutors portrayed Marshall — a former U.S. ambassador and Tony Award-winning Broadway producer — as a greedy heir who couldn’t wait for his mother to die, buying himself a $920,000 yacht with her money but refusing to get a $2,000 safety gate to keep her from falling. Morrissey, whose convictions include forging Astor’s signature on one of the changes to her will, declined to comment as he left the courthouse. Defense lawyer Thomas Puccio said Morrissey planned to appeal. The trial delved into Astor’s shadowy mental state, health problems, finances and family relations. 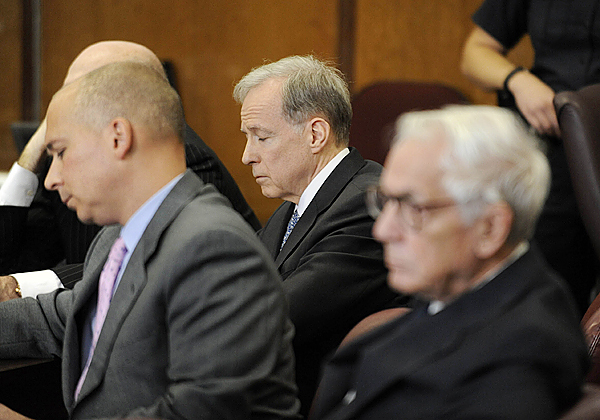 Jurors got crash courses in topics ranging from estate planning to handwriting analysis. Prosecutors called some 72 witnesses. Many of them testified about Astor’s mental confusion in the last years of her life. Walters described using a photo album to help Astor recall guests at her 100th birthday bash during a visit only months later. Kissinger testified that Astor didn’t recognize former U.N. Secretary-General Kofi Annan at a party she threw for him in 2002. Former Brown University President Vartan Gregorian recalled the normally decorous society dame making an awkward toast to Britain’s Camilla Parker Bowles in 1999. Astor’s third husband, Vincent Astor, was the son of multimillionaire John Jacob Astor IV. She took charge of her husband’s philanthropic work after his death in 1959. Her efforts won her a Presidential Medal of Freedom, the nation’s highest civilian honor, in 1998. Marshall is her son from a previous marriage to stockbroker Charles “Buddie” Marshall, who died in 1952. The criminal case against Marshall and Morrissey came after one of Astor’s grandsons asked a court to remove Marshall from handling her affairs. Philip Marshall accused his father of abusing Astor by letting her live in squalor while he looted her fortune. Anthony Marshall denied the claims but agreed in October 2006 to step aside as his mother’s guardian. De la Renta and longtime Astor friend David Rockefeller, who both backed the grandson’s allegations, responded to Thursday’s verdict by noting that they had tried to ensure Astor’s comfort toward the end of her life. 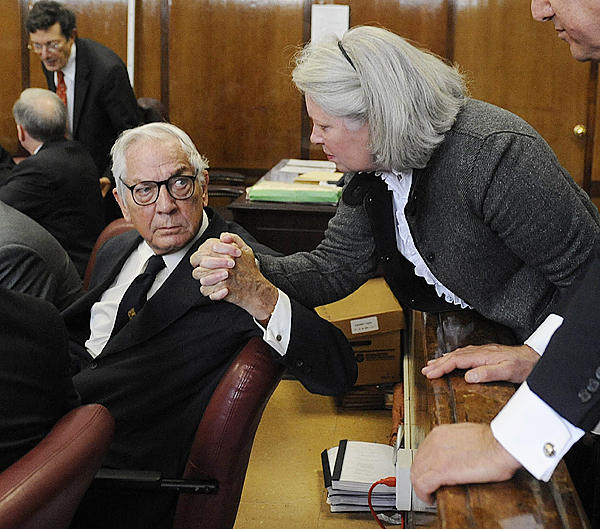 A civil case concerning Astor’s will has been on hold while prosecutors pursued the criminal charges.